(Saga of Crystar the Crystal Warrior#1 (fb) - BTS) - Some time before the Chaos-Order War, the planet of Crystalium was visited by Canadian adventurer Puck (Eugene Judd). He visited the planet via unrevealed means and encountered the king, but not the king’s brother in-law, Feldspar. He stayed on the planet and had many adventures before leaving. (Saga of Crystar the Crystal Warrior#8 (fb)) - Reports of Chaos demons attacking outlaying towns spurred the twin princes, Crystar and Moltar, to investigate. The war party fought and defeated the demons, but with many causalities. (Saga of Crystar the Crystal Warrior#1 (fb) - BTS) - A war broke out between the Forces of Order and Chaos. The exact cause was unknown, but it ravaged nearly the entire planet. When the old king died in battle, there was no official ruling regarding the king’s twin sons, Crystar and Moltar, so it was ruled that the boys would rule jointly. (Saga of Crystar the Crystal Warrior#1) - Months passed as the people slowly rebuilt their lives. The wizard Ogeode, who distinguished himself during the war, arrived at the capital to announce the return of Chaos’s emissary. That emissary, Zardeth would arrive much later, offering the princes a deal: side with him, or their people suffer. Captain Warbow followed the wizard, using the natural foliage as cover. However, it didn’t hide from the wizard’s mystical senses, and after being nearly killed, was only rescued as he fell over the side of a cliff. At the palace, things were growing tense. Crystar and Moltar broke down fighting, which ended with their uncle Feldspar and Crystar being gravely injured. Moltar took over as king, but Ogeode sent crystal rain to strike him and his followers. Meeting with Zardeth at the Fountain of Fire, Moltar and his people were transformed into Magma Men, who then marched on the city. Crystar and his fellow captains were transformed into living crystal and helped to defend the city. The arrival of the transformed Warbow drove off the Magma Men, but captain Stalax was gravely injured. (Saga of Crystar the Crystal Warrior#2) - After the fighting, Crystar and his companions walked through the Galaxian ghetto in an attempt to find a cure for the injured Stalax. A sneak attack by a group of Magma Men forced them to fight and flee with the object of their quest. (Saga of Crystar the Crystal Warrior#3) - Ogeode had set up shop in the Crystal Palace as plans were made to bring back Ika and Crystar. (Saga of Crystar the Crystal Warrior#4) - The Caverns of Chaos proved to be fatal to a group of untransformed Magma Men. When Moltar and a company of his forces marched on the city, Crystar rushed to defeat them. Feldspar banished him and his followers for this act, as Crystar had little knowledge of Moltar’s intentions. Crystar and his followers bid farewell to their families, most of whom lived on the outskirts of the city. 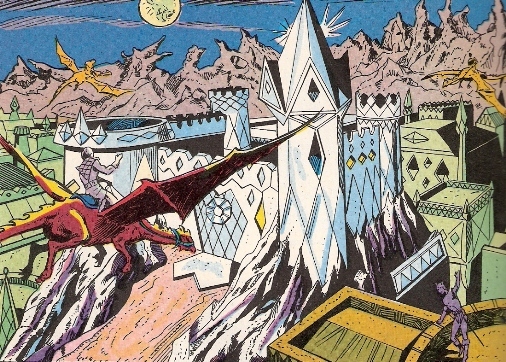 (Saga of Crystar the Crystal Warrior#5) - The landscape of the land changed as Ika’s spell to banish the forces of Chaos backfired, putting the Caverns of Chaos directly next to the Crystal Palace. It would take the combined forces of Ogeode and Zardeth to put their respective headquarters back in their original positions. (Saga of Crystar the Crystal Warrior#6) - Crystalium was again visited by another Earthling; this time displaced X-Man Nightcrawler (Kurt Wagner). The mutant was mistaken for a demon before corrections were made. (Saga of Crystar the Crystal Warrior#7) - The Green Hill people, long-time foes of Galax, launched an attack against the city. The barbarians were driven away by the arriving Crystar. A meeting at the Caverns of Chaos resulted with the tribesmen being transformed into beings of malachite. (Saga of Crystar the Crystal Warrior#8) - Neither side fought as both Crystar and Moltar took a day of mourning. (Saga of Crystar the Crystal Warrior#9) - The Council of Order was taken by surprise by a disguised Zardeth and Malachon. The battle was quick but bloody, as several Magma Men and members of the Council were slain in the fight. (Saga of Crystar the Crystal Warrior#10) - Another battle raged in the streets of Galax as Crystar and Moltar’s forces clashed. (Saga of Crystar the Crystal Warrior#11) - The arrival of three members of Alpha Flight turned the tide against Moltar’s forces. The final battle saw Moltar transformed back to normal, Zardeth and Malachon both slain alongside Bekk, and the forces of Chaos finally vanquished. Crystar assumed the throne on the battlefield. Apparently the people of Crystalium are not a sea faring folk, as many of the Crystal Companions expressed surprise at the boat Ogeode conjured. Somehow Puck got himself transported and back home, but there was no mention of his height at the time. The Caverns of Chaos were a series of caverns deep within an active volcano, and used as a base by Moltar's forces. Galax was the location of the Crystal Palace and seemed to serve as either the capital or at least the major urban area of Crystalium. The Green Hills formed part of the outlaying land surrounding Galax. They were home to the barbarous Green Hill people.